Optimum RX Lens Specialists is an independent ophthalmic manufacturing company. We supply and manufacture a wide range of lenses and coatings for the ophthalmic industry including hard coating, anti-reflection coatings, mirror coatings and lens tinting. We also manufacture and supply prescription Rx lenses, including complex and speciality lenses and our own range of free form lenses. Our laboratory uses state of the art cleaning and lacquering technology together with the most advanced processes and equipment to ensure a consistent high quality service every time. 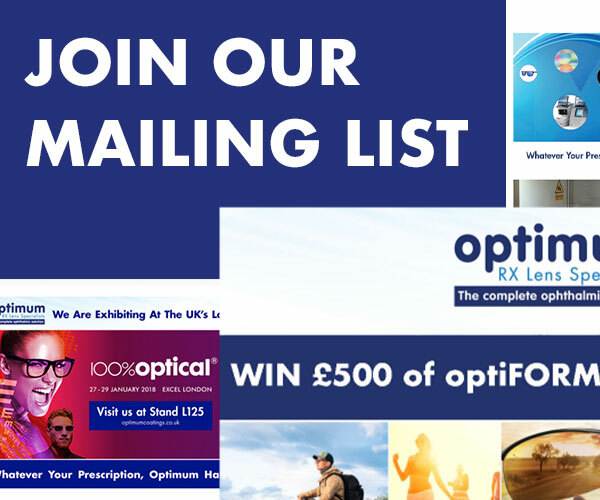 Optimum is the Rx lens and coating supplier of choice for both opticians and optical laboratories delivering the complete ophthalmic solution across the UK. We pride ourselves on delivering the highest quality product with excellent customer and aftercare service whilst keeping our prices very competitive. Our online ordering system makes it easier and faster to access and order the products you need. We also offer express UK delivery with tracking service that sends you automated updates to keep you informed every step of the way. To find out more about any of our lens coating services please contact us. Our standard scratch resistant coating designed to give superior scratch resistance over uncoated lenses. A multi-layer anti-reflective coating with hydrophobic top coat applied over our hardcoat to give excellent visual performance and durability. 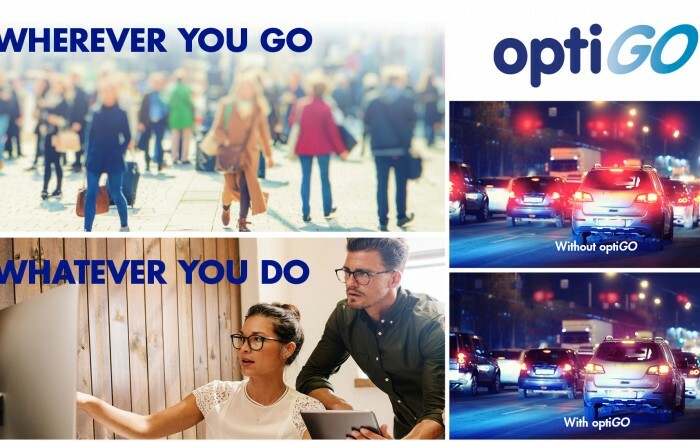 Premium anti-reflective coating combines the benefits of optiMAR, with the addition of ultra-smooth oleophobic properties. Excellent visual performance and durability with protection from front surface UV and back surface reflected UV with super hydrophobic and oleophobic properties. Specifically designed to give added comfort and protection to users of digital devices such as smartphones, tablets and laptops. optiGO is our latest coating designed for everyday use and enhanced for low light and night time driving, minimises reflections and improved eye comfort in times of bad visibility. A semi-transparent mirror coating applied on the convex surface of a tinted or polarising lens. It is combined with an anti-reflective coating on the concave surface. A personalised, back surface Freeform® progressive lens, offering clear vision in all zones. Freeform® technology is the worlds most advanced surfacing technology for creating premium finished lenses. The Free Form surface on the back side of the lens reduces aberrations normally created by the spherical curve on the front side. optiCHROMIC lenses are optimised for super fast adaptation to changing light conditions, even in cold temperatures. Ideal for existing photochromic wearers looking for optimum fade back and enhanced aesthetics. Optimum RX Lens Specialists optiSTAR range allows you to purchase all of your lenses from just one trusted and professional provider – saving you administration time and carriage costs! You can place your orders on-line 24 hours a day 365 days a year, at a time that suits you best. Track your order easily with our on-line tracking system, receive regular e-mail updates or you can speak to our team to get up to the minute delivery information. Our substantial investment in equipment means we never let our customers down. Our years of development experience enable us to work efficiently, creating savings that we pass on to our customers. Gain extra margin by taking advantage of special offers and keeping up to date with what’s new at Optimum. Sign up for our regular email offers and promotions to make sure you don’t miss out on those extra discount opportunities. We hold extensive stocks from all leading manufactures enabling us to provide the fastest turnaround time in the industry. Our Express coating service means your lenses will be treated and dispatched the day we receive them from you. We are a wholly owned independent Company, this enables us to provide you with the right product free from any bias or influence at a very competitive price. We give you the freedom to purchase the products you want. Get the best customer support in the business! Our Customer Service team provide the friendliest most helpful support in the industry. How do we know? Our Customers tell us!! Our coatings carry a full 2 year guarantee against any manufacturing defect from the date you supply the lenses to your customer. We are so confident that you will be fully satisfied with our products that we offer a 30 day unconditional money back guarantee – Would you expect anything less? It’s a SV 1.74 index with +0.50 DS and 20 prism in. How close were you with your guesses? Do you remember the mega high cyl job? We’ve produced a custom polarised & tint combination. A high plus glass RX glazed to the best cosmetic finish possible. We're have Polarised GRADUATED lenses available in our SV and FreeForm lenses. We had a great evening at the Lancaster & Morecambe College Apprenticeship Evening. Welcome to the Apprenticeship Information Evening at LMC!